Everyone is busy these days and it seems that busy pace hits us everywhere: at home, fitting in recreational activities and especially at work. While busy is an expected work state, crazy is not. There’s a difference and it’s time to take a closer look at the jam-packed days of regular tasks and emergency requests. Most employers promise a manageable workload with enough staff and resources to balance tasks, responsibilities and requests. Those who have this consistently may not realize how lucky they are. There are times however, no matter how well a business is run, when overly busy hits. It seems manageable for short periods. After all, who can’t gear up for a fast pace and sense of hurriedness for a little while? This ability to manage excessive busyness is possible during anticipated short-term periods like pre-approved holidays, expected parental leaves and seasonal peak periods. Because these are known situations, they can be managed with pre-planning, extra staffing resources and maybe the promise of a bonus or other reward. Everyone makes it through with a deep breath and a sense of accomplishment. People away for long periods due to unexpected illness or regular (and seemingly predictable) sick days. There is no pre-planning, so fellow employees provide coverage. Bosses discover super-efficient employees and give them special projects, extra tasks and offer overtime opportunities that can lead to burnout. Seasonal busyness can become the regular pace of work and “do more with less” becomes the overriding philosophy. These scenarios, although unexpected, can last for long periods. Employers may apologize, make promises of help or even offer money and time off to make up for the craziness. It may seem like a fair trade except people are left to juggle workloads, stress and all the personal responsibilities which don’t go away. 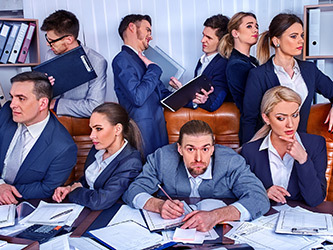 When crazy becomes the new normal at work employees struggle with emotional responses and problem solving even though they are present in the workplace. They may start to use an excess of sick days, take stress leave or worse – quit, all of which generally contribute to the worsening of the situation that should have been short-term. It’s not their fault. This is a situation to be corrected by management before it gets to this stage. So what are the tell-tale signs that overload is present, the situation is starting to turn from busy to crazy and the impact of extra stress is taking a toll? Call it niggling, gut feeling or intuition, there is a clear sense that the situation and its effects are not okay. Something is out of whack and the course to correct it may not be obvious. One would think that tiredness and feelings of exhaustion should facilitate great sleep. Sadly this is not the case when the brain won’t turn off and never-ending worries, thoughts and mental to-do lists persist. It is good to have hope and believe things will be different tomorrow; especially when management says change is coming. Unfortunately when repeated promises are broken and let-downs are consistent, this turns into false hope and only creates continuous disappointment. If friends and family are scared to ask, “how is work?” it might be because the usual response is to describe the injustices, explain the stressors and complain at length. If the response to this standard conversation starter is excessive complaining, there is definitely stress and crazy. When people dread the drive or commute to work because of problems of overload, insufficient resources and promises of “we are working on it” the dread creeps into non-work hours and takes an even greater toll. It is funny how these tell-tale signs may go undetected because they have become common place. If these five points seem like “that is the way life is here” this is a wake-up call for employees and employers. Signs like these will inevitably end in increased sick days, unforeseen stress leave and constant resignations. Excess busy should only be a temporary situation and remain manageable so it doesn’t turn into crazy. Creating change is possible but is best done when motivation and energy levels are high. So what kind of change helps fend off crazy and turn these tell-tale signs around? Assertiveness. Employers need to know when crazy has gone on for too long and is creating stress and negativity. Describe and define the crazy to management and offer solutions on what will help. Sometimes a response of “no” is enough to jolt a manger into the reality of workload and manageability. Employees need to say no respectfully and give the “why” behind the no so there is better clarity on the workload challenges. Figure out what is reasonable and what is too much. Defining these guidelines early is a great way to create clarity for when it is time to say “no”. Workplaces and managers can often underestimate the impact that busy and overload have on people. Some less-scrupulous companies may even intentionally take advantage and not follow through to alleviate stressors. They delay the hire of additional staff or finding resources to save money. Don’t let crazy sneak up at work and fester. Learn to recognize the tell-tale signs so spotting the stress and overload is done quickly and effectively and communicate the findings with management. Control your crazy and keep it to a minimum both in time and intensity. This entry was posted by Pam Paquet and is filed under Business Assertiveness, Employee Training, Time Management. You can follow any responses to this entry through the RSS 2.0 feed. Both comments and pings are currently closed.